Take two liter milk in a big saucepan and make it to boil. Remove from heat, put the lemon juice in the milk, stir constantly, chana is ready. Now take a fine Muslin cloth drain the water from chana. Chana should be completely dry. Make 20 lemon size ball with chana. Make a paste with cashew nuts. Take another saucepan, pour 1 liter milk for payesh into the pan let it boil in medium heat. Put the cardamom seeds and cashew nut mix in the milk, then put the sugar. Let the milk boil at medium-low heat for 30-35 minutes. The milk should be thicken and light yellow in colour. Then put the chana or paneer balls very slowly and carefully, don't let the balls break. Then stir the milk slowly at medium-low heat for another 10-20 minutes or untill the balls become fluffy and smooth. Then remove from heat, garnish with chopped pistachios. Refrigerate for atleast 2-3 hours. 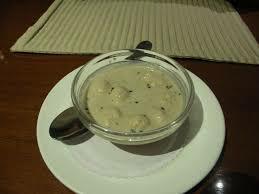 Serve chilled payesh as a delicious sweet dish.